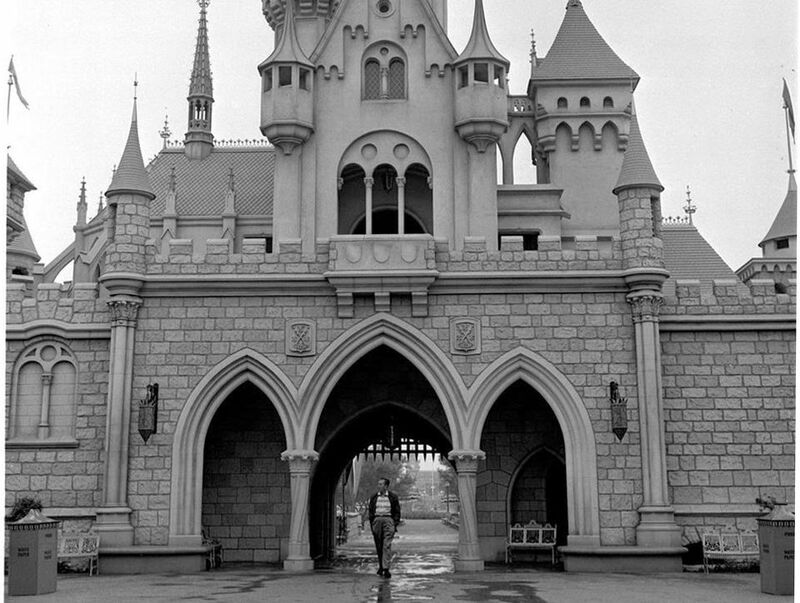 Despite lots of naysayers, Walt Disney persevered and opened Disneyland in 1955. It has since become a treasured piece of Americana and the prototype for the modern theme park. With his passion project, Disney pioneered a new form of entertainment. Let's take a look back at Disneyland's early years, and the man who brought it to life. It Was All Started…in an Orange Grove? Walt Disney's concept of a theme park went through many iterations and possible sites before he and his team settled on a 160-acre orange grove in Anaheim as the location. This is a shot of the grove before construction began on Disneyland. Early on, plans called for a Mickey Mouse park on a small tract of land next to Disney's movie studios in Burbank. When the site moved to Anaheim, Imagineers had more space and developed the hub-and-spoke layout and themed lands that remain to this day. Fun fact: Disneyland is located in the aptly named Orange County, California. Walt Disney World, which opened in 1971, is located in Florida's Orange County. To help finance their theme park, Walt and his brother Roy brokered a deal with the fledgling ABC network. Walt developed the weekly Disneyland television show and in exchange, the network invested heavily in the park. Disney regularly used the program to provide construction updates and whet the public's appetite for his groundbreaking concept. This photo is from the debut episode during which Walt first revealed his plans for his park. In later years, the weekly Disney show moved to NBC. (Everything came full circle when the Disney company purchased the ABC network many years later.) Walt frequently took to the airwaves, pointer in hand, to introduce the latest Disneyland developments. This photo shows crews work along Main Street U.S.A. as Disneyland is under construction. In the decades since it first opened, this part of the park has remained mostly intact. At the far end of the street, you can see the scaffolding that still remains on the spires of Sleeping Beauty Castle. That is not a vintage car parked at the entrance to Disneyland. It is a circa-1950s sedan in this photo taken on July 17, 1955, the day that the park opened. It was an inauspicious start. Because thousands of guests arrived with counterfeit tickets, Disneyland was seriously overcrowded. Women in high-heeled shoes sank into the uncured pavement. Electrical power was interrupted, along with other mishaps. The opening became known as "Black Sunday." Through all of the opening day problems, ABC presented a live broadcast of the event. Hosts of the show included Art Linkletter and Ronald Regan. One of the day’s highlights was Walt Disney's official dedication. A plaque near the entrance at the park features his words, which include: "To all who come to this happy place…welcome…. Disneyland is your land. Here age relives fond memories of the past…and here youth may savor the challenge and the promise of the future. Disneyland is dedicated to the ideals, the dreams, and the hard facts that have created America…with the hope that it will be a source of joy and inspiration to all the world." Children are seen making a mad dash into Fantasyland on Disneyland's opening day. Among the attractions that opened in the park's inaugural year were Peter Pan's Flight, King Arthur Carousel, Mad Tea Party, Canal Boats of the World, Snow White's Adventures, Casey Jr. Circus Train, Dumbo Flying Elephants, and Mr. Toad's Wild Ride—attractions that have withstood the test of time. It Was All Started by a…Train? There were many factors that drove Walt Disney to build Disneyland. One of them was his fondness for trains. He had a miniature train in the backyard of his home that he adored and that he enjoyed inviting guests onto for rides. When he was developing ideas for his park, a full-scale train was always part of the plans. After Disneyland opened, Walt took special delight in its train. A train also encircles the Magic Kingdom at Disney World in Florida. Walt never stopped adding new attractions and improving Disneyland after it opened. He and his team developed four landmark attractions for the 1964 New York World's Fair, all of which made their way back to the California park. One of them, "it's a small world," was an instant classic at the fair and remains popular today. Here, Walt is shown in a production facility where the ride's doll figures were being assembled. The prolific brother songwriting team of Richard Sherman (right) and Robert Sherman penned many classic songs for Disneyland (as well as Disney movies, such as Mary Poppins). Here they are shown rehearsing their most well-known tune, "it's a small world (after all)." Some of the duo's other numbers include "There's a Great Big Beautiful Tomorrow" for the Carousel of Progress, "Miracles from Molecules" for Adventure Thru Inner Space, "The Many Adventures of Winnie the Pooh," and "The Tiki, Tiki, Tiki Room" for the Enchanted Tiki Room.